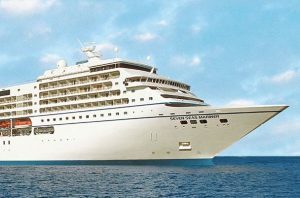 The Seven Seas Mariner is much smaller than most of the cruise ships sailing from Miami. With a maximum passenger capacity of just 700, the Mariner offers an intimate cruising experience with lots of personal service. Nobody gets stuck with an inside cabin on the Seven Seas Mariner. All of the ship’s cabins are suites, ranging in size from 252 square feet to 1,204 square feet. Each has a king-sized bed (that can also be configured as two twins), a private balcony, sitting area, walk-in closet, and marble bathroom. Dining options include the main Compass Rose dining room, regional specialties at La Veranda, a pool-side grill, Prime 7 steakhouse, and French cuisine at Signatures, plus a coffee shop for coffee and snacks. There is no extra fee charged for dining in the specialty restaurants. 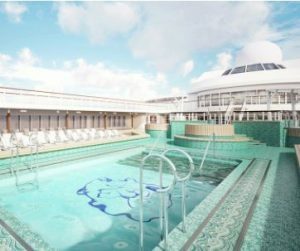 Many things you might pay extra for on other cruise lines are included with your fare on Regent Seven Seas cruises. 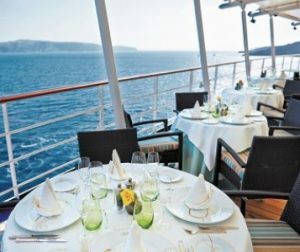 Seven Seas fares include free roundtrip airfare and a free one-night pre-cruise hotel stay, free unlimited shore excursions, free unlimited beverages (including fine wines and premium spirits), free in-suite mini-bar replenished daily, free pre-paid gratuities, free specialty dining, and free wifi.